If you're looking to spice up your Memorial Day barbecue, here's an easy recipe for grilled flat iron steak with bold south-of-the-border flavors. I like this recipe especially because you can do all of the prep work early in the day or even a day or two before you cook the meat, so it's just a matter of spending a few minutes at the grill cooking and you can concentrate on other aspects of Memorial Day. Years ago, when I was the restaurant critic for Las Vegas Life magazine, I visited Mary Sue Milliken and Susan Feniger's Border Grill, located at Mandalay Bay Resort. It was there that I enjoyed one of the best grilled-meat dishes I've ever encountered. --- It was a grilled skirt steak that was marinated first in a puree of jalapenos, garlic, cumin, olive oil and other ingredients. This is my version of that delectable dish. If possible, plan to marinate the meat for 24 hours or longer (up to 48). But, even a 4-6 hour marinade will work. Also, there's no need for precise measurements for the marinade. You might want to add a little more lime juice, another jalapeno or two, additional olive oil, or whatever. The measurements here are approximate. Make it your own. First, lightly toast the cumin seeds in a small, dry skillet (non-stick works great) over medium-low heat, about five minutes. This enhances the flavor of the cumin and releases its aromas. Place the cumin and all of the other ingredients except the steak into a blender. Puree until you have a thin paste with a creamy texture. If the marinade is too thick, simply add a bit more olive oil and/or lime juice. 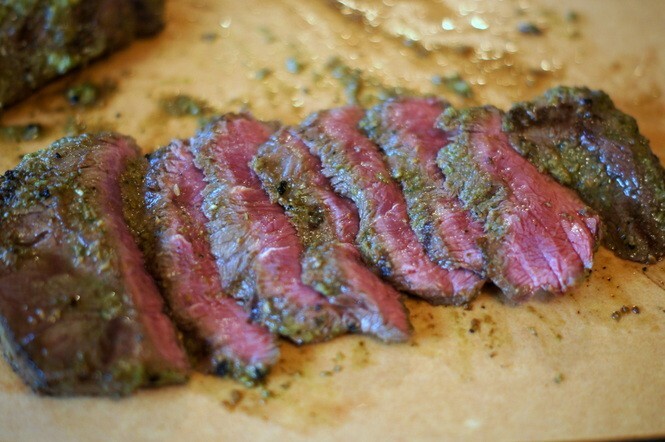 Place the flat-iron steak into a Zip-Loc freezer bag and pour the marinade into the bag with the meat. Seal the bag firmly and refrigerate until ready to use. About an hour before grilling, remove the steak from the fridge and allow the meat to come to room temperature. Heat a grill to high (you could also cook the meat under a broiler or in an oiled cast-iron skillet). Cook the steak until just seared on each side -- about 3 minutes per side for medium-rare (depending, of course, on the thickness of the steak). If you have an instant-read thermometer, the steak will be medium-rare at about 130 degrees F.
Transfer the meat to a cutting board and let rest for 5-10 minutes, loosely covered with foil. Slice the meat across the grain into thin strips. 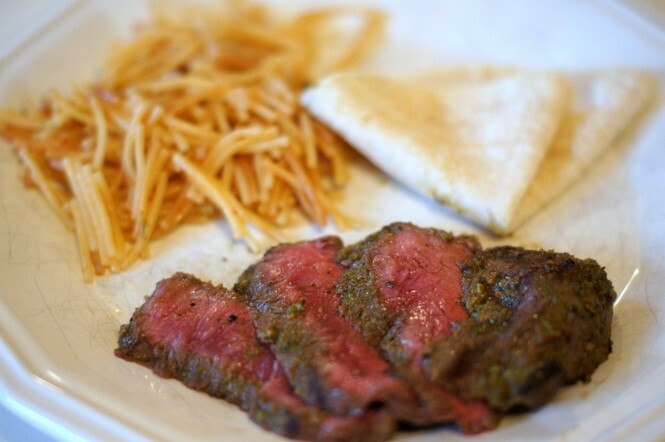 I like to serve the flat-iron steak with warm tortillas and guacamole.